A very early start to get to Big Thicket, a modest amount of mature pine forest north of Beaumont, not that far from the Louisiana border. There are a couple of specialties in Big Thicket, including the endangered Red-cockaded Woodpecker. We had excellent views of the bird, as well as Prairie Warbler and a handsome juvenile Bald Eagle. From there, we drove down to Port Arthur and out to the Gulf at Sabine Woods. 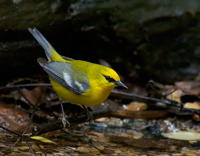 Our timing was terrific: the songbirds that migrate across the Gulf arrive in the afternoon. We were there for the arrival of about half a dozen species, including both Scarlet Tanager and Summer Tanager. We stayed at Sabine Woods until twilight as the birds continued to arrive. It was much less crowded than either Boy Scout Woods or Smith Woods. But a long ways from Winnie. While Sabine Woods is less than 15 miles from High Island, the last hurricane took out the road along the shore. So we travelled around three sides of a square to get back. Once again, it was well after dark when we got back, but a very good day of birding.